Why is this such an important question? Because your safety will depend on the choice you make. If you’re new to I.P.T or you’re considering this option for yourself, a close friend or relative, or even if you’ve had I.P.T. before, there’re a few vital questions you need to ask yourself before choosing or continuing your treatment. Insulin Potentiation Therapy was invented by a Medical Doctor, Donato Pérez García, MD (I) in Mexico City, 83 years ago. The procedure was developed and continued by his son, Donato Pérez García Bellón, MD (II) who taught and trained his own son, the third generation of IPT Doctors, also with the name of Donato Pérez García, MD (III). 3 Generations of doctors developing and specializing this protocol that has helped many patients from different countries and cultures. Now a day, Dr.Donato (III) continues offering this protocol to patients that come from all parts of the globe to receive I.P.T. from the grandson of the true inventor. Over the last 30 years he’s made great effort to propagate his grandfather’s treatment over the world, training and evaluating medical doctors to perform this fine protocol with safety and professional ethics. He’s the proprietor of the U.S. Patent for Insulin Potentiation Therapy (IPT®) and Insulin Potentiation Therapy Low Dose (IPTLD®), copyrights, official I.P.T. Manual of Procedure, scriptures and intellectual property as well as Founder of the Academy for IPT. Till this day, he's the only Medical Doctor with the legal authority to train other physicians. A future I.P.T. physician must be properly instructed on the updated procedure, he must be trained and thoroughly evaluated to perform competently as an IPT-IPTLD Practitioner and only then can he/she be licensed. There are guidelines to follow in this training and they must be respected, to ensure the safety of all patients. 1. Is my doctor an officially certified I.P.T. Physician? Trained and endorsed by Dr. Donato Pérez García? 2. What are his/her credentials and qualifications as an I.P.T. doctor? 3. Who certified him/her or trained him? 4. How many years experience has he/she had giving Insulin Potentiation Therapy? 5. Is he currently updated in the knowledge and new procedure of I.P.T.? 6. Has his/her I.P.T. license expired? This is for your own safety. I.P.T. is safe procedure ONLY WHEN administered by a certified I.P.T. Physician. Whom you choose as your doctor is your choice, but please, keep in mind that not all doctors offering I.P.T. today are licensed, are not trained properly nor certified by Donato Pérez García, MD., affiliations that use his good name to benefit for themselves, like the case of the “IOICP” and “Best Answer for Cancer”, among other associations that have no respect for tradition and an honorable alliance. 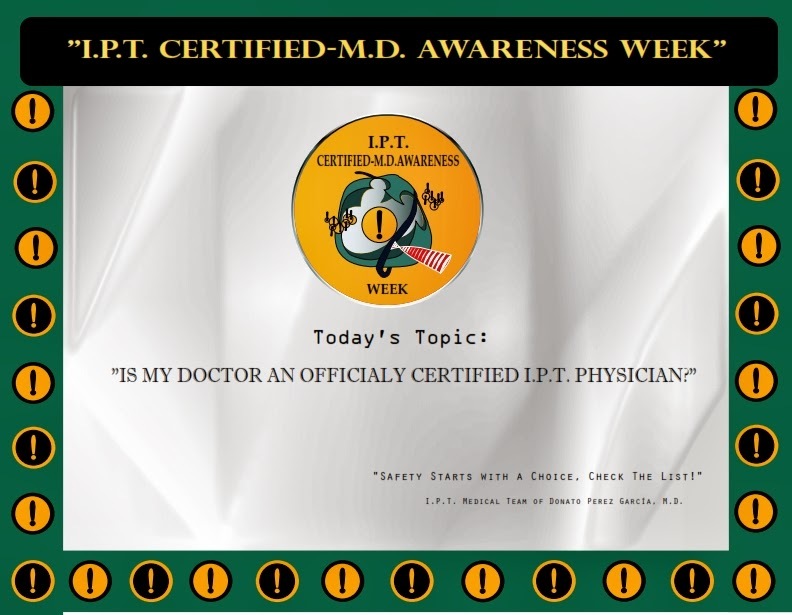 Our concern, as the IPT Medical Team of Donato Perez Garcia, is always your safety and well being. This treatment option is for you, the patient, to benefit from years of anecdotal research and development so you can heal, continue having a good quality of life to do the things you love in life. It is my responsibility to make sure you are in good hands when undergoing my treatment, which is why this “I.P.T. Certified-M.D. Awareness Week” is so important. If you’ve made the choice of IPT, choose your doctor wisely and carefully. Social Networks: Facebook, Twitter, Google+Pages, Pinterest, Foursquare and LinkedIN.